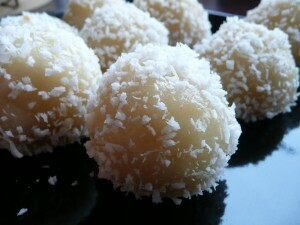 Coconut Balls recipe by Maysa M Hussain at DesiRecipes.com. Mix the grated coconut & sugar powder in to the condensed milk so that it forms a dough. Make balls & cover with some of the sugar & sprinkle with coconut. wouldnt it be too sweet? since condensed milk is sweet already? ?